Well, I am here to confess to the completely acceptable crime of “Stamp-lifting”. What is this crafty deed? It’s lifting stamping ideas and/or techniques from others and making them your own. I was in the mood to make a card today but my brain was mush from a long and difficult week at work. After coming up with no ideas of my own, I starting browsing through the many stamp and craft resource books that I keep on hand. The idea for this card came from Judy Claxton’s book “Rubber Stamp Gifts”, published by North Light Books. Starting on page 14 is a wonderful technique using acetate and Lumiere inks. 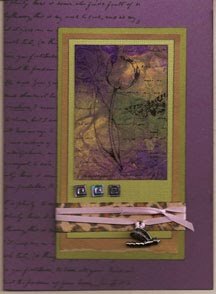 Using my own stamps and card design I made a card of my own using Judy’s techniques.